Driving Master Danny: Hot. Cool. Yours: Borsch. Cut Beef into chunks and put in a pot with enough water to cover the beef, no more. Boil. As soon as it boils (lots of foam), dump into a colander and rinse the meat out. Rinse out pot, put beef back, fill with fresh water. Add Peppercorns and Bouquet Garni. In another pot – double the size of your meat pot – add Onion and Green Pepper and sauté with some butter. Add Carrots (cut into large chunks if you want to discard later, or shredded if you want to eat them). Add about 1/2C of Broth from the meat pot (so the vegetables will not burn). Cook for about 10-15 minutes while you shred the Beets. Blanche whole Tomatoes, peel. Dice. (you can substitute a can of diced tomatoes here, just make sure it’s high quality) Add to pot. Add more broth. Add the vinegar. Stir very well to distribute. Check on meat, it should be getting soft. Keep cooking both the vegetables and meat until meat is soft. Remove meat and set aside. Add left over broth from the meat pot into the vegetable pot. Add Potatoes. Shred the Beef with two forks, it should resemble pulled pork. Add the shredded Beef back into borsch. Stir the whole pot. Taste, add salt to taste. If the ratio of ingredients to liquid is too thick, add boiling water to dilute. Cook until potatoes are soft. Turn it off, you’re done! 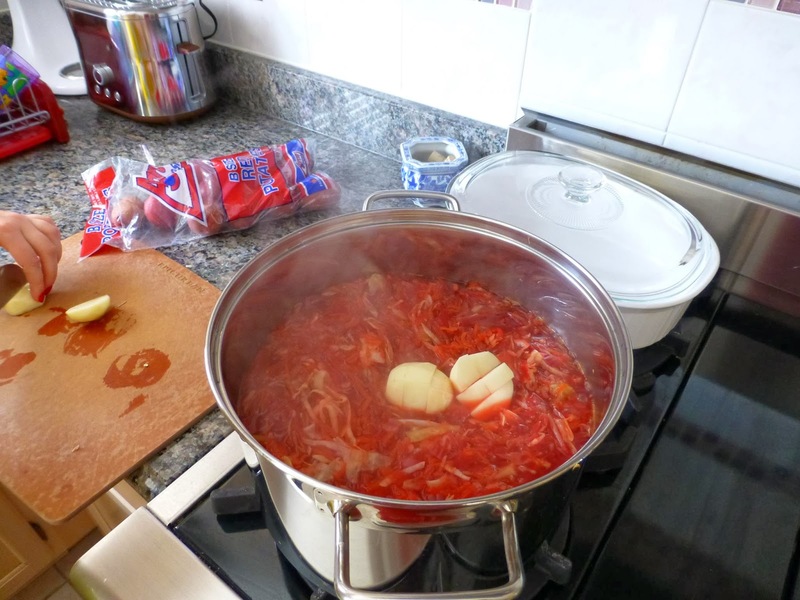 Do NOT eat right away, it needs to sit and think about being borsch for several hours. Absolute best if eaten the next day. Serve with a dollop of sour cream and fresh dill sprinkled on top. *During Soviet times there was only one cookbook How to Eat Nutritiously. It covered every possible food from baby food to caviar, from a simple peasant family meal to a state dinner. It came in only two editions: one with ingredients measured in grams, and the other in buckets. (Family and army). My parents still have the book, its pages are yellow and the spine is falling off, but it still holds most unimaginable magical Russian recipes.